This outfit has been on repeat since the weather is almost like summer over the past month. 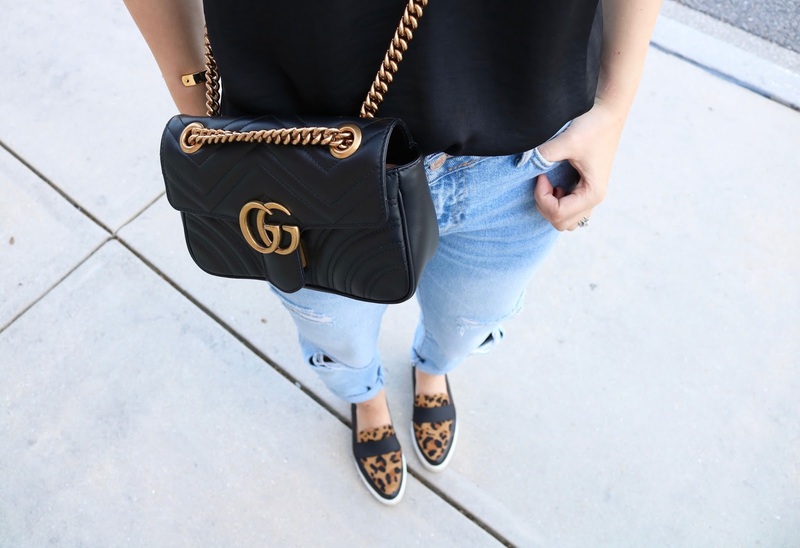 Not sure if you have seen it but I have had major late 90’s flash backs with the boyfriend denim, lace cami tops and so much leopard. Don’t get me wrong I am LOVING it all and I am happy to have it back and I am glad I kept a couple things from those days (I may be a slight hoarder when it comes to clothes, please don’t judge). Who, What, Wear has been killing it with their Target collection and I got this cami for a great price and have loved it dearly. When I was online ordering the top, I may have put a couple more of their items in my cart also, oops. Shop some of my favorites below. Thanks for stopping by and I hope everyone gets to see a little bit of sun today! Great lace cami, looks amazing with relaxed jeans and your gucci bag is gorgeous! Great post, have a great day. I thought the 90's vibes were so weird at first but I seriously love them now! This outfit is too cute – I so need toget my hnds on that cami!